Electrons are scary. They run in the reverse of the direction we expect them too (because we had a 50/50 shot and we blew it) and do all sorts of magical things. In the Wagovan, however, they weren’t doing much of anything until yesterday. When I bought my project Wagovan, seller sort of failed to mention it didn’t come with a battery. I purchased an el cheapo one ($42!) from Pep Boys, but didn’t put it in... until yesterday. First off, I went ahead and painted the battery tray. It wasn’t super rusty, but with the car not running and the battery out already, now seemed like the time. Two coats of “rusty metal primer” and two coats of “truck bed liner” and we’re in business. That done, I checked the resistance between the positive and negative: 65 Ohms. Not great, but the rising resistance means I’m reading though some non-restive loads (capacitors and inductors) and the reading being non-zero means I don’t have a dead short. So... cool? Nothing burst into flames. Good sign! Holy crap I missed that Honda beeper noise! Such nostalgia. 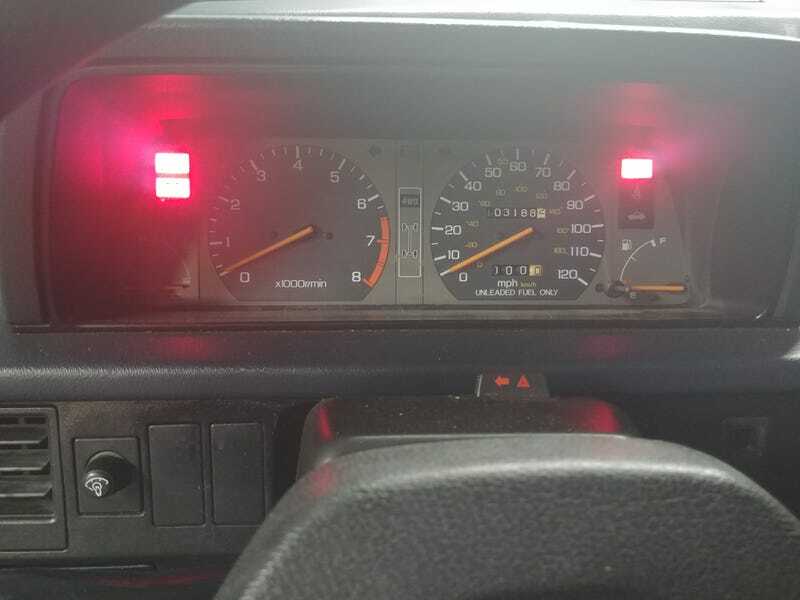 Fuel gauge - OK? Seems to be reading empty, but it does rise from the stop. I’m working on an update for the fuel system work, but as apparently my Oppo posts are some of the first results when you google the Weber kit I’m using, I feel like I need to up my game a little, so I need to go home and take more pictures. With enough caffeine and motivation, I might be able to crank this think this weekend!